EGS Australia has successfully completed the Carnegie Clean Energy Limited geophysical site investigation over the proposed Torbay site at Albany in Western Australia. The purpose of the geophysical survey is to establish the offshore geology and suitable strata thickness to inform the technical and economic feasibility of the proposed CETO 6 foundation design. 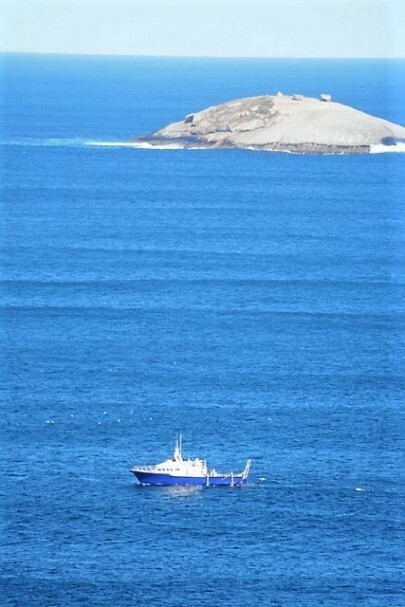 EGS Survey has delivered the survey operations, utilising the vessel Business Class (right figure) owned and operated by Empress Marine of Dunsborough. In addition, South Coast Natural Resource Management of Albany is providing a local expert in marine fauna who has been on board the vessel to ensure the operations conform with all state and federal legislation regarding marine wildlife. 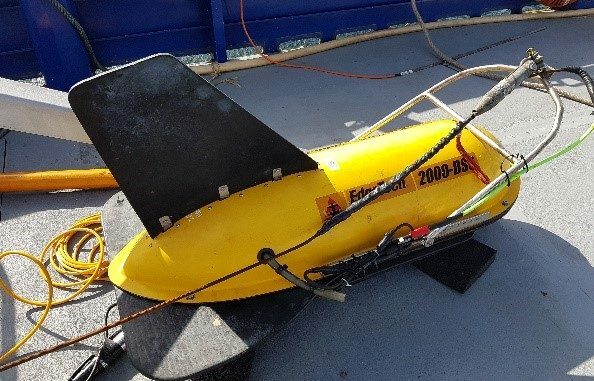 The planned reconnaissance lines have now been completed and collected very accurate bathymetry data, seabed sediment identification and geological data to a depth of approximately 50m below seabed. This has allowed for the identification of basement granites and the required thickness of younger rocks that are preferred for the foundations. A detailed grid of data was acquired that will provide depth to granite and thickness maps of the younger strata. The geophysical survey team has consisted of three vessel crew, four survey crew, a client representative for Carnegie and a marine mammal observer. These have been supported by the Carnegie and EGS management teams from Perth and Albany. Carnegie Clean Energy Limited is an ASX-listed (ASX: CCE) solar energy, battery storage and wave energy, project developer with over 10,000 Australian shareholders. Carnegie is the 100% owner and developer of the CETO Wave Energy Technology intellectual property and is also 100% owner of leading Australian battery/solar microgrid Engineering Procurement and Construction (EPC) company Energy Made Clean (EMC). EMC specialises in the delivery of mixed renewable energy microgrid projects to islands and remote and fringe of grid communities. Carnegie is the only company in the world to offer a combination of wave, solar, wind, battery storage and desalination via microgrids which are ideally suited to islands, off grid communities and fringe of grid locations. Within Australia, Carnegie delivers its solar energy and battery storage projects via a joint venture between Energy Made Clean and multinational property and infrastructure company Lendlease (ASX: LLC). The Department of Primary Industries and Regional Development (DPIRD) is committed to building vibrant regions with strong economies through jobs growth, economic growth and capable people. The Department is responsible for the effective planning, coordination and delivery of the State Government’s regional development agenda. This includes the management of the Royalties for Regions investment program and maintaining effective relationships with key partners across government, industry and the community. The Western Australian State Government, via DPIRD, is investing $15.75 million in grant funding into the Albany Wave Energy Project and a further $3.75m into the Wave Energy Research Centre via the University of Western Australia. ARENA was established by the Australian Government to make renewable energy technologies more affordable and increase the supply of renewable energy in Australia. Through the provision of funding coupled with deep commercial and technical expertise, ARENA provides the support needed to accelerate the development of promising new solutions towards commercialisation. ARENA invests in renewable energy projects across the innovation chain and is committed to sharing knowledge and lessons learned from its portfolio of projects and information about renewable energy. ARENA always looks for at least matched funding from the projects it supports and to date has committed $1.1 billion in funding to more than 270 projects. For more information, visit www.arena.gov.au. ARENA has transferred $11.7m of undrawn grant funds from Carnegie’s $13m CETO 6 Project funding from Garden Island to Albany.